The project partners ENAC, Università Cattolica del Sacro Cuore, ENDO-FAP, Christlichen Jugenddorfwerk Deutschlands e.V. , IES Virgen de la Paz and EfVET met at the Warrington UTC to start the project that will last three years to study the English model and test it in the Italian, Spanish and German context. The project aims at supporting the renovation of VET systems in Europe with the ultimate goal of tackling Early School Leaving and increasing the employability of youngsters while fostering their active role in society. 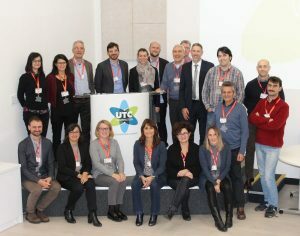 In order to reach this objective, the project intends to further strengthen the key and technical-professional competences of young people attending the VET pathways, analyzing and adapting the English UTC model to the Italian / German / Spanish context. The idea is to transfer the English model to training realities in other countries to face the training gap and the ESL. On one side there will be the provider partners (schools from the UK) that will transfer their successful models and, on the other side, the user partners that will study these models and try to adopt these good practices to their national contexts. After the meeting, the partners spent three training days at the school to better know the variables of the model.